Babes & Kids: This is another of those sites that I find I frequently have giveaways entries at. Nice stuff! 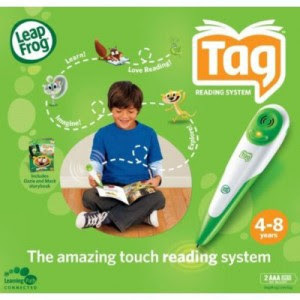 Leapfrog Tag In addition to that Leapster system, B&K is also giving away a Tag reading system. This is the "older brother" of the Tag, Jr. system which I know is a very nice gadget. My son and I have played with the Jr. and it's definitely going to be a popular item here. There are over 25 books available for the Tag system making it something that won't get old fast. 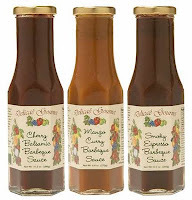 Delicae Gourmet GC Born2Impress is giving away a gift certificate for Delicae Gourmet, an online shop that specializes in gourmet sauces and dressings among other things. I thought that a $20 GC wouldn't go very far but Delicae Gourmet is very reasonably priced! Divvies: You can win a 3gal. 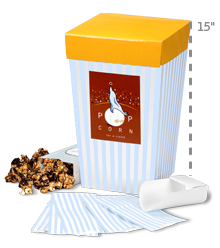 popcorn tin from a rather unique candy shop- they specialize in candies and sweets while considering food allergies. The munchies look spectacular! Your Baby Can Read Honestly, I'd seen the commercials on TV and thought, "Nuh uh. No WAY!" but the more I hear about this, the more I think there's something to it. While I wouldn't necessarily want an infant learning to read (there are limits to "pushing" to me), I think that if it could help a reading-aged child make more sense of the words, it's got potential. The winner of this giveaway gets their choice of kids' BabyBanz, some really nice looking sunglasses. Baby Banz are best known for their unique wrap-around, banded design and 100% UV protective lenses. Someone will win a pack of 5 Kid Konserve Food Kozies in their choice of lime green or orange. I LOVE these! The "convenient 13" round circles are made of recycled, FDA approved, non-toxic, non-leaching, recyclable PE plastic. They contain no Bisphenol-A or Phthalates." Essentially, you just wrap them around your sandwich, fruit, veggies, cookies, whatever. Then just wash them up and do it all over again. There's a 4-pk of winter flavored SoftLips lip balms going to the winner here. In addition to these limited edition flavors, SoftLips carries some unusual ones like Chai Tea, Papaya, and Acai Berry. There's a new outdoor game on the market called Djubi and Otherhood is giving one away. It's a neat cross between a ball being launched a standard butterfly-net style catch. 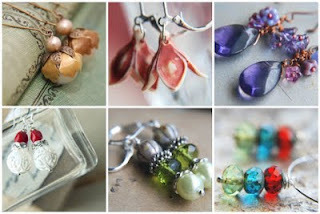 There are two great jewelry giveaways at the Veater Family blog right now. The first is for New Fashioned Whispers. This is an etsy shop and has some really fantastic looking pieces, many of which have, as you may guess from the shop name, a new but old-fashioned look to them. 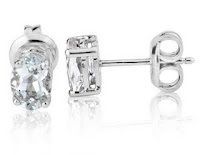 The second giveaway is for Joolwe Jewelry. While this is more traditional jewelry, there's a wide selection and they have an interesting program that I haven't heard of at many jewelry stores- every dollar spent earns you points towards free jewelry. My old blog partner is addicted to all things Leapfrog. I'll definitely be passing this post along. Thanks for such great insights!